Cork manager Ephie Fitzgerald believes his young side have the potential to return to past glories, as they clung on for an inspirational victory over champions Dublin. Galway manager Tim Rabbitte wants to see his side hit new heights against Cork in the Lidl NFL Division 1 final after they eased past Donegal in the last four. UL captain Eimear Scally praised her team-mates' efforts after DJ Collins' squad turned on the style to win the O'Connor Cup. Home defeats for both of last year's All-Ireland finalists in the opening round of the League sent shockwaves through the competition. Sarah Rowe, Cora Staunton, Yvonne Bonner and Ailish Considine suffered defeats in their opening games of the AFL Women's (AFLW) season. 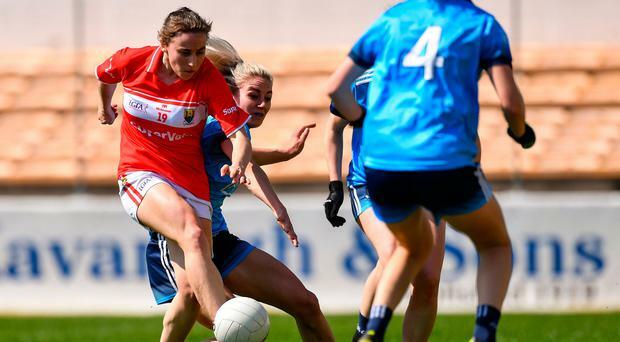 It's been a rocky road to the top for the Dublin ladies footballers and Niamh McEvoy intends on making hay while the sun shines in the capital. Bríd Stack, who won 11 All Ireland titles with Cork, has announced her retirement from inter-county football. Mayo Ladies manager Peter Leahy has confirmed that the 12 players that walked away from the squad last summer have not returned. Mourneabbey manager Shane Ronayne hailed his players for finally peaking on the big occasion to claim the All-Ireland senior club title at the fourth attempt. For manager Mick Cronin, it was a dream come true to see Clontarf become the first Dublin team to win the ladies All-Ireland intermediate club title. Kate Hannon scored 0-11 and scooped the Player of the Match award as Glanmire got the better of Tourlestrane in Ballinasloe. Kate Hannon scored 0-11 and scooped the Player of the Match award as Cork’s Glanmire won their first ever All-Ireland junior club title with victory over Tourlestrane at Duggan Park in Ballinasloe. Driven on by the heartbreak of final defeats in three out of the past four seasons, Mourneabbey were finally crowned All-Ireland ladies senior club football champions with an emphatic triumph over Foxrock-Cabinteely. Even on the heartbreak barometer, today's ladies football All-Ireland senior club finalists are hard to separate. All-Ireland senior champions Dublin have been honoured with seven representatives on the 2018 TG4 Ladies Football All-Star team. Roisin McGovern proved the super sub for Foxrock-Cabinteely at Bray Emmets, as her late goal sent the Dublin champions into their first All-Ireland final since 2016. Peter Leahy has been handed a two-year extension as Mayo ladies football boss which will see the Westmeath native remain at the helm until 2021.